Cruelty-free fashion that doesn’t harm a hair, a strand of fur, or a feather on an animal’s head is the way of the future. The government of New Zealand has banned the practice of mulesing, meaning that the legs of lambs used for wool will no longer be restrained between metal bars while farmers carve huge chunks of skin from their backside. The new rules were introduced under the Animal Welfare (Care and Procedures) Regulations 2018 and will come into effect on 1 October. Meanwhile, in Australia, it’s been more than a decade since the wool industry’s peakbody –ironically named Australian Wool Innovation Limited – promised to fast-track the industry away from mulesing. And yet, more than 80 per cent of our country’s wool producers continue this barbaric practice, most of them without offering any pain relief. In Australia’s wool industry, merino sheep are specifically bred to have wrinkly skin, which means more wool per animal. The wrinkles collect urine and moisture, which can attract flies to lay eggs in the folds of skin, and the hatched maggots then eat the sheep alive. Mulesing is a crude attempt to create a smoother skin that won’t collect moisture. But the exposed, bloody wounds often become infected or attract flies anyway. Many sheep who have undergone the mulesing mutilation still endure slow, agonising deaths. 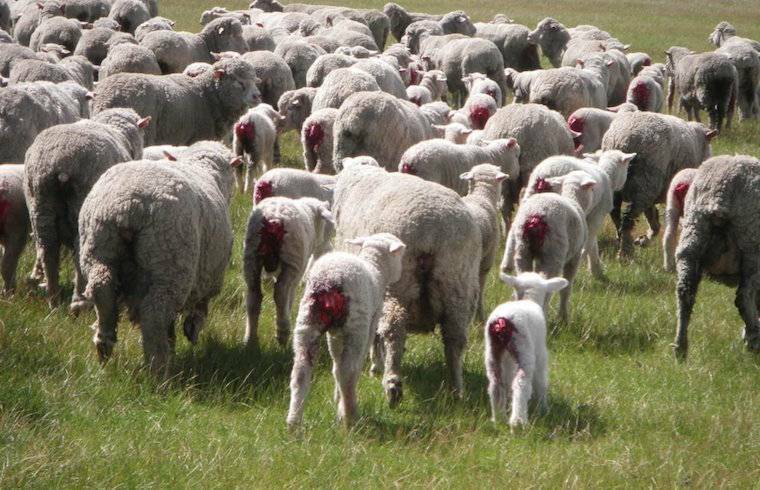 Even after they’re mulesed, sheep continue to suffer for wool production. Multiple investigations show that workers punch scared sheep in the face, stamp and stand on their heads and necks, and carelessly cut gaping wounds into their bodies. Australia’s failure to take meaningful steps towards better care of sheep is shameful and damaging to our country’s international reputation.